By the year 1919, Harry Houdini was known throughout the world as a master magician and escape artist. Having conquered the stage, he set out to rule the screen, appearing in a series of thrillers built upon his almost supernatural powers. 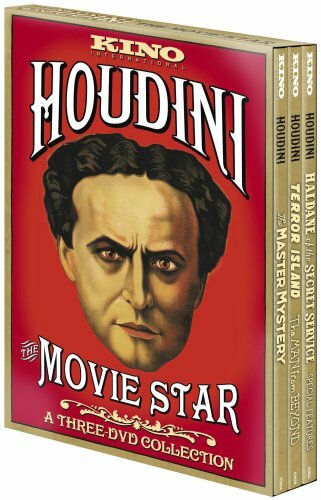 Culled from film archives and private collections, this Kino DVD set includes all of Houdini s suriving films as an actor, rare footage of actual handcuff and straitjacket escapes, and a wealth of historical information. Includes: THE MASTER MYSTERY (1919, 238m, Color Tinted) TERROR ISLAND (1920, 55m, B&W) THE MAN FROM BEYOND (1922, 68m, Color Tinted) HALDANE OF THE SECRET SERVICE (1923, 84m, Color Tinted) THE GRIM GAME (Fragment, 1919, 5m, Color Tinted) - SPECIAL FEATURES INCLUDE: Filmed records of Houdini escapes (ca. 1907-23) - Audio recording of Houdini speaking (1914) - Excerpts from the NY Censor Board files - Slippery Jim, a 1910 Houdini-inspired comedy - The illusion Metamorphosis performed by Houdini s brother Hardeen and others.